No matter what we do, every one of us in business has the same challenge: How to get more clients. The first steps to get more clients has a very specific vocabulary: Revenue goals, forecasts, prospect lists, reports, proposals, follow up, scripts, EFFECTIVE scripts, and the very worst: Cold Calling. We have all been taught how to DO what we do, but almost without exception, we are never taught how to get more clients, by the people who teach us. So let’s talk about how to get more clients. The most important first step is this one: To start, I only want you to do it 22 minutes at a time. Just 22 minutes. Roughly the length of a 30-minute comedy show on television of you remove the commercials. See? That’s not so hard. But in return for just 22 minutes, you have to put your best foot forward for that time. No bathroom breaks or any other distractions. The next step is to create a list. Let’s make it a short list, 25-50 prospects that you think could be a consistent user of your product or a referral source. If 50 is too high, then I’ll let you get away with 25 (hey, it’s YOUR business… I’m just the voice in your head giving you marketing advice). These have to be solid choices. Take your time and make this list great. Each person on your list must fit your target market. If you need assistance with creating your target, I suggest you grab a copy of The Small Business Marketing Plan and fast forward to the beginning of Day 2. The third step is to make contact with each person on your list. This is going to take time. You will not get through immediately to everyone. In fact, it is going to take a lot of effort. This 3rd step is why people hate it when I tell them that everyone is in sales. Hatred of rejection. But here is the secret towards getting more clients through sales: It’s just numbers. More calls equals more sales. 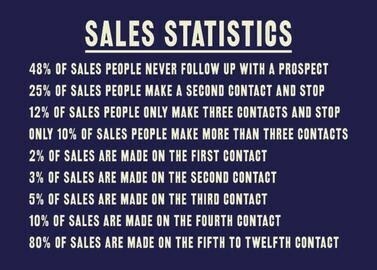 If you want those numbers to be fewer, you have to get better in sales. That is what the next few steps are for. Step 4 is to get them to answer the phone and take your call. Step 5: When they say hello, your first response is to ask for a moment of their time. If they say no, let them know you will call back another time. Most likely they will ask who you are. That is when you move to step 6, the Introduction Call. Let them know that you will be forwarding additional information and ask if it would be alright for you to follow up shortly thereafter. Most will say Yes but some may say No. That is THEIR problem, not yours. Your job after the phone call is, as soon as possible, to send them an interesting email or snail mail, perhaps an awesome promotional product, so that you begin to stand apart from all your many competitors. It is beyond crucial that you become memorable above everything so that you are top of mind when the need arises. Ask questions designed to give you insight into how your product will solve their problems. Step 8: repeat the entire process over and over, 22 minutes a day. When you can do 22 minutes easily, then increase it to 28 minutes. Why 28? Simple: Psychologically, I don’t want you to think that it is a half hour. It ISN’T. It’s just 28 minutes. But you still can’t go to the bathroom. This blog has been written to give you the basics of how to get more clients. And a bit of a pep talk. If you take nothing else from it, it is that we all, you and your fellow entrepreneurs, all have the same challenges though we are in different industries. When you need help in the process, get in touch with us at Yuloff Creative Marketing Solutions, either through the website or call us at 800-705-4265. You can also get a free marketing assessment at www.BoxFullOfMarketing.com. After you take it, you will be sent right into our calendar where we can talk about how to get more clients, or any other marketing challenges.